My name is Tim Pratte and I live in Bedford, NH. 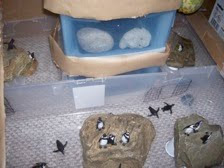 I love penguins, and they inspired me to build the model of the New England Aquarium. I made this model in about a year. It is a very nice model, not just because it looks cool, but because I made it mostly out of recyclables. For example: boxes, paper, and plastic. I also used a lot of TAPE!! 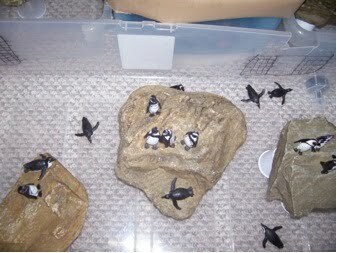 Over the past year, when I was building this model, I became more and more interested in penguins. I was so interested I even memorized all of their names by their bracelet colors. Example: Pip [my favorite penguin] has his bracelet on the left because he is a male. His bracelet color is pink, so I know him as pink left. I am still studying the penguins, and someday I hope I can work at the New England Aquarium. This picture the giant ocean tank in my model aquarium. All the coral is from Florida. Thanks, Tim! So are you curious about Tim's favorite penguin, Pip? Stay tuned, we'll be sharing some more information about him very soon! Wow that was amazing!! I'm so glad I got to see your model aquarium. It looks great. We are very proud of Tim. His interest and love of natural life should inspire us all to be caretakers of nature's wonders. Great job Tim! Your blog is cool and the model of your penguins looks just like the actual penguin exhibit. Wow Tim this is great! The kids love it!